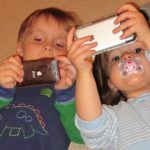 Social Media: Good or Bad for Kids with iPhones? When it comes to careers, it might not be so bad. My family is great. We’re Clevelanders. We’re loud and annoying. But darn are we passionate! Last week I got a chance to see my sister on North Carolina soil for the first time since 2006. That was when her and my Calabash, NC livin’ mom had a fallout. My sister’s dramatic. My mom’s dramatic. That’s just us Clevelanders. And although the trip was an overall success with plans of the next trip already being discussed, my niece got Cleveland’d by my ole man for using her iPhone at the table. His look of disgust woulda killed Jose Mesa after Game 7 in the ‘97 World Series. And with every ounce of sincerity inside he yells, “Get off them *$&@ things! You’re missing out on the world around you.” Exactly. But I myself am a victim of circumstance. I myself have bought into the game. Because, well, the game is fun. I like seeing my buddy’s dumb drunk pics or promoting my businesses or being able to access my iCal whenever. My dad Cleveland’d her good. And by the end I even had to step in to defend the 15 year old nerdist and her vacation friend. I think it does boil down somewhere along those lines to the job seekers out there. What can we learn from this high schooler who can’t even drive about being “wired in” or “connected.” A lot. 1. Technology is getting better. Why fight it? It’s easier now to complete tasks in a more efficient time. 2. Information is easier to access and like Newman said in Seinfeld, “When you control the mail, you control…information.” Same notion applies. With the control of a smart phone you can access the Internet. With the internet breeds information. 3. Self-Marketing gurus are born every day. With all this usage of new media, kids are going to learn tricks of the trade faster than ever. And for those inspired drivers, it will only be a better means to an end. They’ll learn to adopt this social media they’ve known since they were 5 and parlay it into a successful career. Who knows, my social media expert in 2035 might be someone who’s celebrating her 1st birthday today. 1. Lazy. Kids don’t need to invest time into searching for answers like the olden days. There’s something about using a hard bound book full of facts to complete a science report. It made you feel like you actually accomplished something by doing it with more obstacles. 2. Impersonal social marketing. It’s extremely easy to just email or message someone. It’s also extremely impersonal. Gone are the days of phone calls. Why call someone to get trapped into a 5 minute conversation when you just need one answer? Well because you need to have that 5 minute conversation to better develop your relationship with the end user. These are what makes us humans. We talk to each other and communicate. Why not do it using your voice instead of your fingers? 3. You’re missing the world. Try traveling in the car and actually looking outside the window. You might see something cool. Try it. I’ll play the game though. I need to do it because my competition already has been doing it for years.